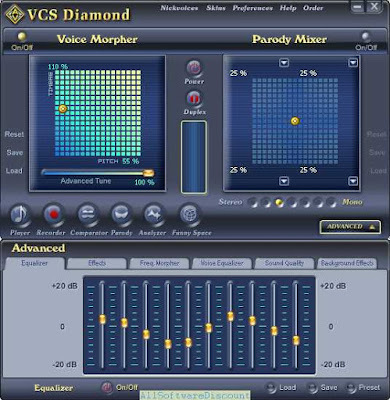 Released in late 2013, Voice Changer Software 8.0 Diamond is the latest version of VOICE CHANGER SOFTWARE series being updated on both UI,UX and features. The program is able to capture and modify any vocal input from virtually any source (microphone, streaming audio, etc) and then manipulate that input with a wide variety of effects to create a unique and natural vocal output. Its "nickvoices" or voice presets has also been optimized for better quality in voice real-time changing. Do voice-over and voice dubbing for audio/video clips in which various characters' voice could easily be created from one single voice. Improve your own voice in any presentations or narrations and make you feel more confident before the crowd. Create voice messages, voice mails, E-greeting cards, etc. in both emotional or funny and hilarious ways. Make your broadcasting become more interesting with voice effects, funny sounds or background audio applied. AV Audio Editor, AV Audio & Sound Recorder, Sony Sound Forge, Adobe Audition, Audacity, Adobe Captivate, Camtasia, GoldWave, Reaper, Soundbooth, CrazyTalk, etc. **Using the program for tricky things or abuse is not recommended for online games. You may always be banned from the games if you do that. AV Webcam Morpher, Skype, Ventrilo, TeamSpeak, Yahoo Messenger, MSN Live Messenger, AIM, XFire, GoogleTalk, Roger Wilco, Net2Phone, GSC, X Lite, Voxox, VoipStunt, VoipBuster, QQ, Psi, Mumber, Nimbuzz, Mohawk, Eyball Chat, Callcentric, and more. Why Should I Buy FULL version? VAT included in prices (this may benefit users from EU countries most).